Mix of green, blue and purple. Product received quickly and as described. Quick delivery, item in excellent condition. Great price , fast shipping, ,. Thanks VERY GOOD QUALITY. Great seller, fast, no problems, would use again! I like that it doesn't slide/move off a pencil and that the finger placements are good. It's not soft, comfortable plastic. My child won't use it because it's hard. Worked like a charm for my 6 year old. On the very first day, she started holding her pencil correctly. Used in teaching kindergarten. Vital in encouraging proper writing grip on pencil. 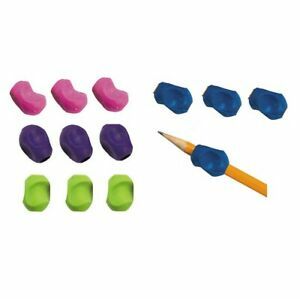 Perfect for lkindergartener's little fingers! Good value!